The advanced age certainly will not make you retire from exercise and sports activities. However, many parents experience a tendency to slow down and become less active because of their age. In addition, health factors are also the cause of exercise is not like a young age, a sense of worry also entered into the trigger some parents avoid certain sports for fear of falling, sprains and so forth. But keep in mind, with exercise and exercise on a regular basis will make the body stronger and healthier even for the elderly though, but need to pay attention to the types of sports that are suitable for those who are elderly. 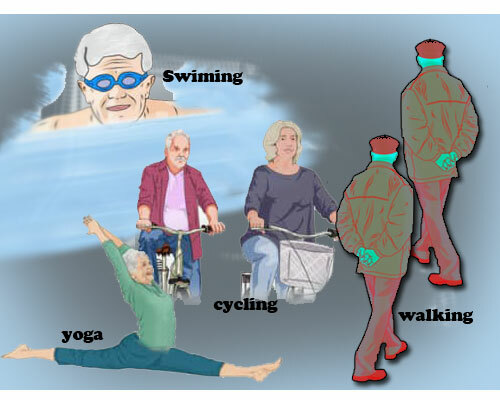 Regular exercise will offer a myriad of great benefits to the elderly including reducing the risk of falling, better muscle health, bone density, better sleep and sound sleep, avoiding the risk of stroke and heart attacks, reducing the risk of dementia and so on. For that, for you elderly, here will be presented some kind of sport that is suitable for you try, what is it ?, check it out! If you want to always be healthy when you enter old age, then start by walking. Walking is the perfect way to start a sport without a strong challenge. In addition, exercise is a type of exercise that anyone can do, including parents. By walking will help increase heart rate, increase breathing, build endurance, strengthen muscles, improve blood circulation, reduce the risk of heart disease, improve sleep, increase mental strength and support joint health in the body. A study in 2014 published in the Journal of the American Medical Association reports that a moderate-intensity exercise program such as walking helps reduce major mobility disability for 2.6 years among adults at risk of disability. Another nice thing about walking is that walking does not require special equipment, other than a pair of comfortable walking shoes. In addition, it can be done anywhere. In Islam, swimming is a highly recommended sport of Prophet Muhammad SAW. In addition to the Prophet, health experts also recommend swimming as a sport that is suitable for all circles especially for the elderly. The benefits of swimming are great for health. People who regularly swim will get physical and mental health. Other benefits that can be felt with swimming is to help the body stay fit and burn calories in the body, strengthen muscles and improve cardiovascular fitness. Swimming can also reduce stress and tension in the body joints. Yoga is very beneficial for an aging body. The three main elements of yoga are pose (asana), meditation (dhyana), and proper breathing (pranayama) and they are beneficial to the body. If yoga is done at a moderate pace for 15 to 20 minutes each day, it can help you lose weight, improve sleep quality, and delay the aging effects of aging and pathological conditions. A study in 2012 published in the International Journal of Yoga reports that a modified yoga-style yoga program is likely to be beneficial in improving mobility and reducing fears of falling for parents, the study requires additional research to go through randomized controlled trials. A 2017 study published in the Journal of the American Geriatrics Society reports that chairs yoga has a positive effect on the pain and physical function in adults with osteoarthritis. A 2013 study published in the Indian Journal of Psychiatry found that yoga intervention seems to improve the quality of sleep of older people who live in old homes. Some yoga poses suitable for parents are shavasana, uttanapadasana, naukasana, pawanmuktasana, ardha shalbhasana, shalbhasana, bhujanasana, makrasana, anulom vilom pranayama, and bhramri pranayama. Cycling is a highly recommended physical activity for parents to do. In fact, there is no age where cycling ceases to be an option, and anyone who cycles regularly will get a longer life (in the health sense). Activities that are considered lightweight it can make you stay fit and confident high. Exercising with cycling is great for your heart and immunity. In addition, by cycling regularly then you have improved good mental health, build strength and stamina, help fight symptoms of depression, anxiety or high stress. Riding a bike is also an eco-friendly way to explore the world around you. Now that you're retired, take time to explore your area and get physical and mental benefits at the same time.